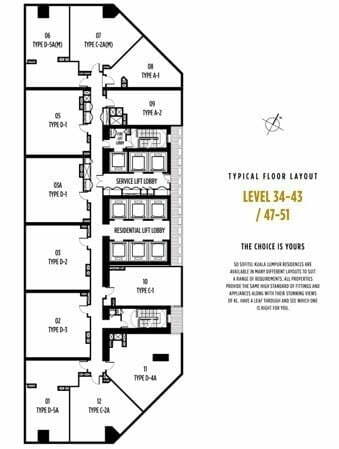 马来西亚吉隆坡 OXLEY TOWERS KLCC - SO Sofitel Luxurious Condo Selling Below Market Value! Approx. 300M to KLCC Petronas Twin Tower (Heart of Golden Triangle). Own An Luxury Condo in the Heart of KLCC. A NEW KL LANDMARK IN CLOSE PROXIMITY TO THE KLCC TWIN TOWER! Compare to surrounding developments like Four Seasons & 8 Conlay >RM3,000 psf, So Sofitel is a steal! Fine restaurants nearby include Spice of India, House Of Sundanese Food, Chili’s Grill & Bar, Ah Yat Abalone Forum Restaurant, Madam Kwan’s Restaurant (KLCC), and Il Lido Italian Dining. For nightlife lover, Zouk Club is just a stone’s throw away from the property. Oxley KLCC Tower is close to numerous embassies, namely Royal Danish Embassy, Royal Swedish Embassy, Embassy of the Kingdom of Morocco, French Embassy, Embassy of the Republic of Korea, Embassy of the People’s Republic of China, to name a few. The development is also near to elite schools such as Sayfol International School, Institut Kojadi, PNB Investment Institute, Raffles Lasalle International Design School, SMK Seri Ampang. Oxley Towers KLCC comprises of a two-storey retail galleria; a 29-storey strata office block; the 78-storey So Sofitel luxury hotel and serviced residences; the 49-storey Jumeirah luxury hotel and serviced residences. Over the past two decades, Jumeirah Hotels & Resorts has captured the imaginations of the most discerning global travellers with the brand promise of STAY DIFFERENT™. These two words encapsulate the multitude of personalised experiences offered at iconic properties including the Burj Al Arab Jumeirah in Dubai, Grosvenor House Suites By Jumeirah Living in London and Jumeirah Himalayas Hotel in Shanghai. At the heart of Malaysia’s vibrant capital, an elegant new icon of modern luxury living is on its way. A place where every moment inspires and enlivens – a place you can truly call home. Welcome to Jumeirah Living Kuala Lumpur Residences. 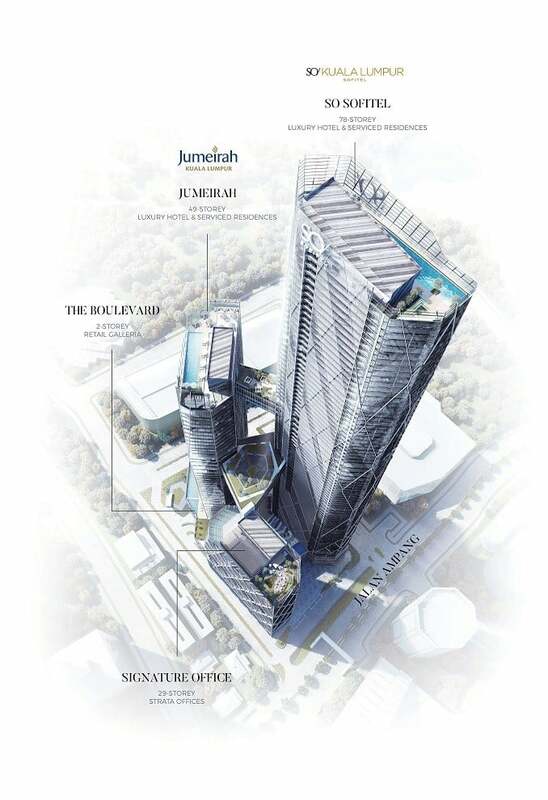 Together with Jumeirah Kuala Lumpur, a five star luxury hotel, it will grace the new Oxley Towers development – a landmark destination due to transform Kuala Lumpur’s skyline by 2021. A PRIME ADDRESS NEXT TO THE PETRONAS TWIN TOWERS. Oxley Towers KLCC is located along Jalan Ampang and just a stone throw away from the Petronas Twin Towers. Excellent transport links at your doorstep via the LRT which is linked to Kuala Lumpur International Airport via rail access. The Oxley Towers KLCC comprises of a office tower, a Jumeirah Hotel with residences, a So Sofitel Hotel with residences, and a retail podium linking all the three towers ranging from 28 to 79 storeys. The Jumeirah tower will offer 181 hotel rooms and 267 home units while the So Sofitel tower will offer 207 hotel rooms and 590 home units. Both the Jumeirah Hotel and So Sofitel Hotel are expected to be completed in 2021. SIGNATURE OFFICE UNITS is Now Hold ON for Sales (Pending for Bulk Purchase Deal)! Buyer to submit MyKad (Malaysian) or Passport/ NRIC (Foreigners), signed booking form & cheque for booking. 1. Buyer pay 1st 10% and 2nd 10% (Foundation Done) direct to Developer’s account in Malaysia. Thereafter, follow standard payment schedule. Free Legal Fee for Loan Agreement Only.